‘The United States Of Planet Earth‘, released by Mira Sound Germany on Audio Single and DVD, is Michel Montecrossa’s New-Topical-Song about the way into the future. The United States of Planet Earth / are my vision of the future world. / The United States of Planet Earth / with the Unites Nations as world government. The United States of Europe / are my vision of the next step, / and the decision to reach the great goal / of the United States of Planet Earth. The living celebration of humanity / is my vision of the future world / on an earth of peace and happiness, / of freedom and joy for all. Through work for all and equal wages, / through justice for all in all lands, / through giving and taking in the right way, / through friendship of all on the future planet. The United States of Planet Earth / are my vision of the future world. / All nations united in the will for peace / and progress on the way into space age. Space age time. / Space age wide. ‘Die Vereinigten Staaten des Planeten Erde’, veröffentlicht von Mira Sound Germany auf Audio Single und DVD, ist Michel Montecrossa’s Deutsch-Topical-Song über den Weg in die Zukunft. Die Vereinigten Staaten des Planeten Erde / sind meine Vision der Zukunftswelt. / Die Vereinigten Staaten des Planeten Erde / mit den Vereinten Nationen als Weltregierung. Die Vereinigten Staaten von Europa / sind meine Vision des nächsten Schritt, / und die Entscheidung, das große Ziel zu erreichen / der Vereinigten Staaten des Planeten Erde. Die lebendige Feier der Menschlichkeit / ist meine Vision der Zukunftswelt / auf einer Erde des Friedens und Glücklichseins, / der Freiheit und Freude für alle. Durch Arbeit für alle zu gleichen Löhnen, / durch Gerechtigkeit für alle in allen Ländern, / durch Geben und Nehmen im richtigen Maß, / durch Freundschaft aller Menschen auf dem Zukunftsplaneten. Die Vereinigten Staaten des Planeten Erde / sind meine Vision der Zukunftswelt: / Alle Völker geeint im Willen zum Frieden / und Fortschritt auf dem Weg in die Weltraum Zeit. Weltraum Zeit. / Weltraum weit. ‘The Government Is Out’ concert series at the Spirit of Woodstock Festival 2010 in Mirapuri, Italy, released by Mira Sound Germany on 2 Audio-CD or DVD boxes features the incredible performance of 140 songs by Michel Montecrossa, Mirakali and Diana Antara during ten days from July 30th till August 8th 2010. Included are great-feeling-of-life and freedom songs of Michel Montecrossa, Mirakali and Diana Antara like ‘The Government Is Out‘, ‘Future Power‘, ‘Rebellion‘, ‘Fire Of Love‘, ‘Road Rocker‘, ‘Feel The Fire Burning‘, ‘Road Angel Rock‘, ‘King Of Bliss‘, ‘Skylinerocker‘, ‘Storm Of Light‘, ‘Love Hotel‘, ‘In Your Heart‘ and ‘Dark Angel Rock‘ as well as 127 more acoustic and electric top-songs by these powerful artists. In addition the boxes contain a bonus-DVD with Michel Montecrossa legendary cinema vérité ‘Going To The Spirit Of Woodstock Festival in Mirapuri, Italy‘. ‘Talking Lines of Fire’, released by Mira Sound Germany on Audio Single and DVD, is Michel Montecrossa’s New-Topical-Song about default from Europe to America and everywhere. We go to the streets all over the world. / Banka-Gangstas take away the little we have. / They feed their greed on our tax money. / Food, job and housing are the lines of fire. Food prices are high and wages low, / we can’t pay the rent for our home any more. / Trouble is creepin’ into our minds. / The banka gang is grinnin’ unkind. In the lines of fire we struggle everywhere, / in Greece, in Italy, in Portugal and Spain, / in England, Ireland, Iceland and the whole world. / We, the people, understand very well. Bankas rob the people’s tax money / and governments must stop that. / Governments are there to serve the people, / they aren’t there to make us poor. Governments must establish real value banking / that invests in real work and in real products, / shares risk and profit on equal terms / so that the working hand will be free again. The lines of fire are there all over the world. / People must unite for action freedom. / People know what people need / and together can right what went wrong. ‘China Means Future‘, released by Mira Sound Germany on Audio Single and DVD, is Michel Montecrossa’s New-Topical-Song about a positive future of Europe-China cooperation. China means future, China is huge. / Land is there and riches for / all its people and their working force, / their force of progress and their drive of hope. China means future, China is huge. / Promises are there for a world of / green revolution and cooperation / of different systems and minds. The future is different from what we see today: / The future is young and new everywhere. / China means future, China is huge. / The chinese youth will know what to do. A day will come for all to be one, / for Europe and Asia to be united and strong. / China means future, China is huge. / In working together we will find every clue, / every clue. 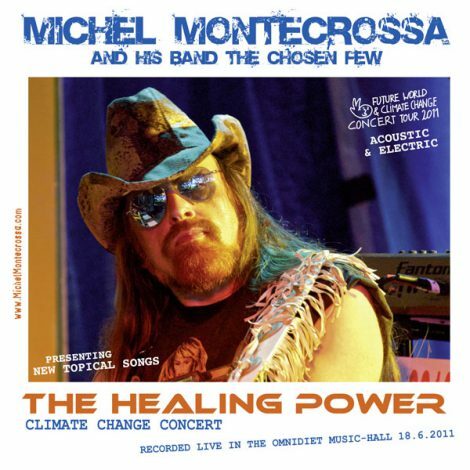 The Healing Power’ Climate Change Concert with new topical songs, released by Mira Sound Germany as Double Audio-CD and DVD is Michel Montecrossa’s ninth concert of the Future World & Climate Change Concert Tour 2011. Performed in the Omnidiet Music-Hall in Mirapuri on 18th June 2011 the concert features 30 acoustic and electric songs for strengthening love as the basis of the future world including the title song ‘The Healing Power‘ and more up-to-date acoustic songs like ‘Germany Is Green For The Future Of Europe‘, ‘Die Vereinigten Staaten Des Planeten Erde‘, ‘Willy’s Song‘, ‘Ballad Of Lost Dreams‘, ‘Shakti Ballad‘, ‘When I Think Of Your Tomorrow‘ and ‘Way To The Well‘ as well as great electric songs like ‘How Many Oceans‘, ‘I Just Met A Soul‘, ‘Sweet Blessings‘ and 17 more acoustic and electric songs. 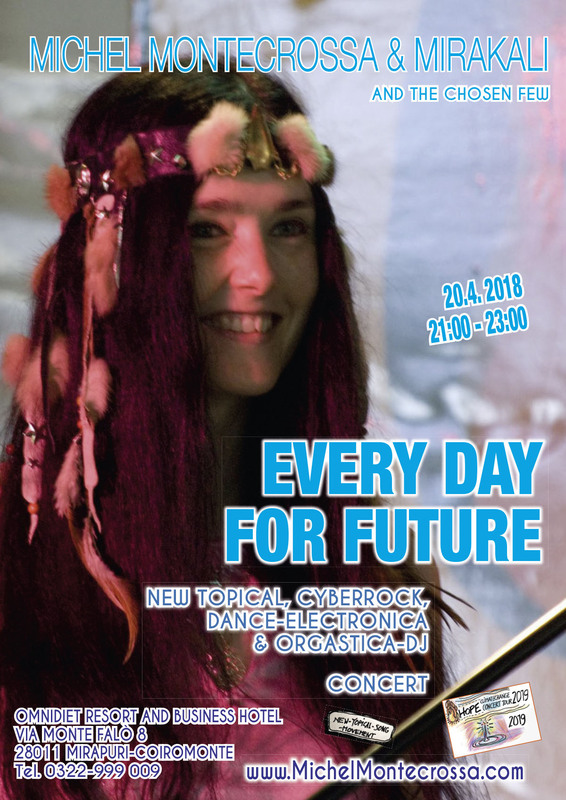 Mirakali and Diana Antara contribute heartfelt songs like ‘HealthyWorld‘ and ‘Happiness Is Our World‘. ‘A Journalist’s Song’, released by Mira Sound Germany on Audio Single and DVD, is Michel Montecrossa’s New-Topical-Song about news of the world, truth and media. Secrets Of The Green World‘, released by Mira Sound Germany on Audio Single and DVD, is Michel Montecrossa’s New-Topical-Song pointing to the answers of nature and love to our many questions. Come all ye great people from all over the world. / About the secrets I will sing, the secrets of the green world. / They are waitin’ around the bend, / are the harmony of the green world, / the most effective way to our liberation / from anguish and from pain, the self-renewing way / to peace and out of poverty. Problems are problems if you don’t know the truth. / Givin’, I say, leads to truth. The secrets of the green world / are her ways of givin’, creatin’ abundance and all / that we can find to strengthen body and mind / and a happy soul. She’s the well of immortal life, / she is the giver of light.